Darren Stockford meets Bungo Womble. It’s Saturday 18 July 2009, 10.30 am. I’m at the London Film & Comic Con in Earls Court Two, an exhibition centre in south west London. I’m queuing to meet the man behind – or rather inside – one of cinema’s best-loved robots, R2-D2. 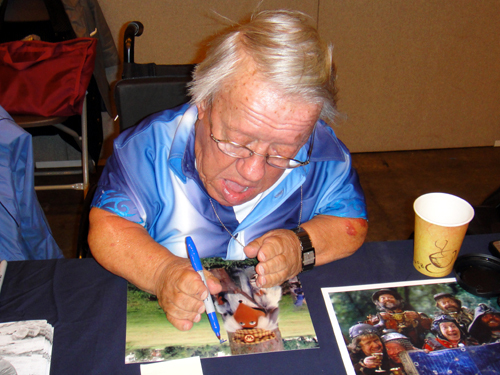 Kenny Baker made his name playing Star Wars’ diminutive droid, a part that launched his career. 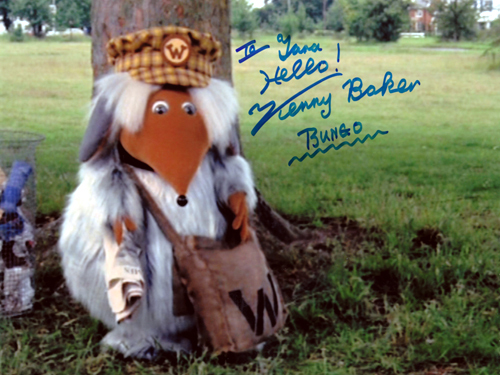 However, that same year, 1977, Baker also appeared in Wombling Free as Bungo, the film’s lead Womble. Over the years, the actor has appeared at many conventions here in the UK. As a regular of certain events myself, it occurred to me recently that, the next time we were in the same room, I ought to ask him to sign something Womble-related as a surprise for my wife, Tara. And so I find myself waiting in line with a bunch of Star Wars fans: them holding various pieces of Artoo memorabilia, and me clutching a homemade (though professionally printed) 8″x10″ screenshot of Bungo Womble. What, I wonder, will Kenny make of it? After all these years, will he recognise the character? Will I have to jog his memory? Worst-case scenario: he’ll think I’m ‘having a laugh’ and I’ll have to plead my case. Despite these little worries, I’m not at all nervous. I’m more wary of the other people in the queue seeing my Womble pic than of showing it to Kenny himself. When the moment comes, I greet Kenny and show him the photo, framing it with: “Here’s something a little unusual for you. I bet you don’t see many of these.” His joy is instant. He lets out a half-chuckle, half-cheer and turns immediately to Peter Mayhew, aka Chewbacca, who’s sitting on his left, to ask him: “Guess who?” Kenny shows the picture to everyone in the immediate vicinity, and I feel like the guest who’s brought the perfect present to the party. I’m relieved – no, better than that, I’m pleased: pleased to see Mr Baker take pride in a little-celebrated role. Naturally, he’s happy to sign the picture, which I ask him to dedicate to Tara. “She’s a big fan of the Wombles,” I explain. Kenny carefully writes his dedication and signs the picture, adding an explanatory ‘Bungo’. He poses with me for a quick snap and I thank him for his time. With my mission accomplished, I head for a quiet corner to admire the results (pictured). Kenny Baker, there: science-fiction legend, gentleman, Womble. In any order you like.